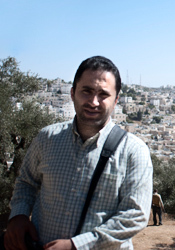 Issa 'Amro is a field researcher for B'Tselem, the Israeli Information Center for Human Rights. Based in Hebron City in the West Bank, Issa’s work aims to document human rights violations in the Occupied Territories at significant personal risk to his own safety. Use content from this website or that of the Office of the High Commissioner for Human Rights to develop your own information materials – posters, flyers, brochures, fact sheets - about Human Rights Defenders around the world, and translate them into the language of your community. Use the Human Rights Day 2010 design to stamp your publications, website, banners, t-shirts, pins etc. Hold a forum, public lecture or discussion panel to recognize local human rights defenders who have fought against discrimination in your community. Unite the citizens in your community in a common symbolic act, e.g. lighting of candles, raising of a flag, or reading of stories, in honour of those who have died or who have experienced discrimination, harassment, imprisonment or violence in their fight for human rights. Organize a concert, street theatre, dance, local festival or other popular presentation where local human rights defenders are recognized and celebrated. Make your own promotional video for defending human rights. Choose a public space to set up a video camera and invite people of your community to come and express how they are or can become human rights defenders who act to end discrimination in their daily lives. Host a film screening highlighting famous human rights defenders and their actions to speak up and stop discrimination. Don’t just stop at Human Rights Day! Use other existing events and observances throughout 2011 to draw attention to the work of human rights defenders, e.g. International Women’s Day (8 March), International Day for the Elimination of Racial Discrimination (21 March), and World AIDS Day (1 December).